Sitcom style. Won't lose much on video. An attempt to do for hair stylists what "This Is Spinal Tap" did for heavy metal, "The Big Tease" is a middling mockumentary about a naive and falsely confident Glasgow beauty shop owner who flies to Los Angeles for a world champion hair competition (! ), only to discover he's not really invited. 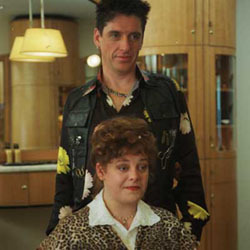 Co-written by and starring Craig Ferguson (the British boss on "The Drew Carey Show"), this comedy of the uncomfortable traces the emotional rollercoaster ride of flamboyant hairdresser Crawford Mackenzie, whose ego takes a beating when a back-stabbing, plastic personality publicist (Mary McCormack) explains his RSVP is for reserved seats in the audience, not on stage. It's a courtesy sent to all members of WHIF (the World Hairdressing International Federation), and Mackenzie soon discovers it doesn't entitle him to a complimentary room at the Four Seasons, either. So after being thrown out, he and a BBC crew -- which tagged along thinking this would be a big story back home -- find themselves camped out in a crappy San Fernando Valley motel while our hero hairdresser makes desperate, frantic and humiliating attempts to force his way into the tournament for the coveted "Platinum Scissors." Ferguson and director Kevin Allen (who plays Mackenzie's boyfriend back in Scotland) fine-tune their farce with comedically authentic details (trophies shaped like hair dryers) as we get to know the clueless Mackenzie, who honestly thinks he's global because he once gave Sean Connery an emergency trim. The premise kicks into high gear when Mackenzie rescues a talent agent (Frances Fisher) from a horrible hair-do and finds himself with a powerful ally in L.A. that might be able to muscle him into the competition after all. My problem with "The Big Tease" was that I found Ferguson's character grating and hard to root for, even in the face of outrageous back-stage sabotage by his rival/idol Stig Ludwiggssen (David Rache) -- the arrogant, golden-maned, famous and filthy rich owner of a Berverly Hills salon. Mackenzie just struck me a dim-witted prat, and I couldn't even laugh at him, let alone with him. Director Allen doesn't stick to his format, either. Ostensibly we're watching the TV crew's finished documentary, but director Allen has added all kinds of superfluous, dash-about camera work and edited chunks of the movie with an MTV edge, completely out of step with the parts that feel like authentically obtuse BBC footage. Carried by a few flat laughs, which are largely based on watching Ferguson play foolish, "The Big Tease" becomes little more than a tiresome, transplanted, sports underdog plot, complete with a showdown finale (exaggerated, six-foot-tall hair-citecture) and cornball cameos -- including David Hasselhoff, salon celebs Jose Eber and John Paul Mitchell, and of course, Drew Carey, in a bad wig and a bright suit.